With the game scoreless in the second, Brandon Snyder's solo home run and Dan Butler's sacrifice fly gave Pawtucket a 2-0 advantage. Leading 2-1 in the fifth, Butler scored on a balk by Rochester pitcher Logan Darnell. Snyder would add a two-run home run in the sixth to open up a 5-1 PawSox lead. After De La Rosa left the game, Pawtucket came unglued in the seventh. Dalier Hinojosa faced five batters, allowing five runs (four earned) on three hits and a walk without recording an out. Rich Hill would relieve Hinojosa, allowing an unearned run on two hits and two walks, striking out the three in his lone inning of work. At the end of the seventh, the Red Wings held a 7-5 advantage they would never relinquish. Rochester's comeback was fueled by two costly fielding errors and a wild pitch. The rehabbing Shane Victorino was 0 for 4 with three strikeouts. As a team, Pawtucket hitters struck out 15 times and were 0 for 7 with runners in scoring position. Portland extended its winning streak to six with an exciting 5-3 victory over the Binghamton Mets (NYM) in 11 innings. Mike McCarthy hurled the first 5 1/3 innings for the Sea Dogs, allowing three runs on seven hits and two walks, striking out three. The Portland bullpen was superb, with Michael Olmsted, Aaron Kurcz, and Robby Scott combining to toss 5 2/3 innings of scoreless relief. Blake Swihart's RBI single in the first gave the Sea Dogs a quick 1-0 lead. Tied 1-1 in the fifth, Portland would bring home two on a Deven Marrero RBI single. The Mets would score a run in the bottom of the fifth and the bottom of the sixth to tie the score, 3-3. The two teams would remain deadlocked until the 11th, when Matt Spring crushed a two-run home run to put the Sea Dogs on top, 5-3. The victory comes as Portland was just 3 for 16 with runners in scoring position. Mookie Betts had another solid day atop the Sea Dogs order, going 2 for 4 with two walks and two runs scored. Greenville found itself on the wrong end of an evenly contest matchup with the Asheville Tourists (COL), losing 4-2. Sergio Gomez picked up the loss for his 5 1/3 innings of work, allowing four runs on five hits and a walk, striking out two. Raynel Velette and Mike Adams combined for 3 2/3 innings of scoreless relief, allowing just one base runner. Down 1-0 after a half inning, the Drive tied the game on an RBI ground out off the bat of Tim Roberson. Even though Greenville was aided in the inning by two walks and two wild pitches, they were only able to walk away with the one run. The Drive's only other run of the evening came in the seventh, as Zach Kapstein roped an RBI single to center. As was the theme with the other affiliates, Greenville fared poorly with runners in scoring position, going just 1 for 12. Co-Players of the Day: Even though he had just one hit on Tuesday, Matt Spring's two-run home run in the 11th inning of Portland's 5-3 victory kept the Sea Dogs hot. Spring had been 0 for 4 with four strikeouts prior to the at-bat, salvaging what had been a tough day at the plate. 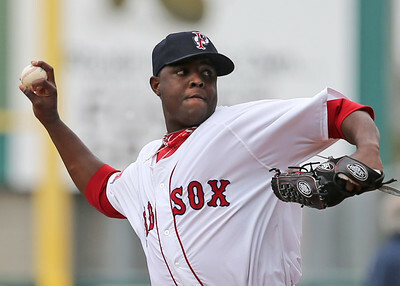 Rubby De La Rosa is someone many prospect watchers are keeping an eye on, with a hot start to the 2014 campaign. The 25-year-old right-hander pitched solidly in Pawtucket's 7-5 loss, hurling six innings, allowing just one run on three hits and a walk while striking out seven. Thus far this season, De La Rosa is 1-0 with a 1.19 ERA in four starts. Even more impressive is the fact he has allowed just 11 hits in 22 2/3 innings of work, striking out 21 and walking just four.